On May 30th 2014, Jose and Dania Collazo’s life was turned upside down when there 22 month old daughter Daniella Marie Collazo was diagnosed with Stage III Neuroblastoma. The feeling they felt during these first few days of the unknown and not knowing what direction their life would be taking them with their daughter’s health was one of desperation. This feeling is one they will never forget; nothing else at that point mattered. Daniella’s health was second to none; once Daniella was diagnosed doctors reacted quickly with a plan of attack to begin a battle against this monster. First doctors began to treat the opsoclonus myoclonus immediately after diagnosis with immune globulin also known as IVIG. This first hospital stay was over two weeks long. 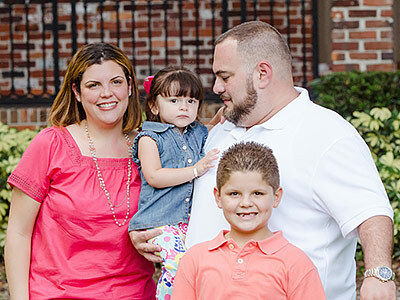 Once a plan of action was put together by Daniella’s oncologist and surgeon, the Collazo family returned back to the hospital for surgery and began chemotherapy. This whole process kept the Collazo family in the Hospital for 2 months. During these tough times, work to support their household was not even an option and taking care of their child was now complete priority along with also caring for Daniella’s older brother Daniel. Unfortunately, the reality of life set in quickly when the bills and financial obligations did not stop. In due time, Dania Collazo began to realize that there was no other option and urged Jose Collazo to return back to work. It was important that Daniella would have to return back to her home to recover from all the treatments. During this time, the amount of support the Collazo family received was amazing; the out pour from people all around was what inspired Dania Collazo to dream of one day having a foundation of her own to give back and help children and families during their battle with childhood cancer. On July of 2015 that dream became true when Jose and Dania Collazo, thanks to the help of Charo Bolanos, Esq., were able to launch Team Daniella’s Foundation. Still in her own battle Dania Collazo has decided that she inspired by her daughter would continue to fight her own battle and help others during their own battle as well. This along with caring for her own daughter will be her life’s work. The Team Daniella’s Foundation will provide assistance to families of children suffering of cancer they will also help children smile whether it be a special gift or request from one of these children who deserve everything. Raising awareness of childhood cancer will also be a priority the world needs to be alerted of childhood cancer and the suffering these children go through on a day to day. Promising research will also be funded, Government funding for childhood cancer is not a priority and 4% funding is not enough. It is up to us to create funds to help save the lives of these children.